Feel free to stop by/follow my blog! gorgeous photos! And who couldn't love that cape?!?! The red of the cape is delicious against all-black. 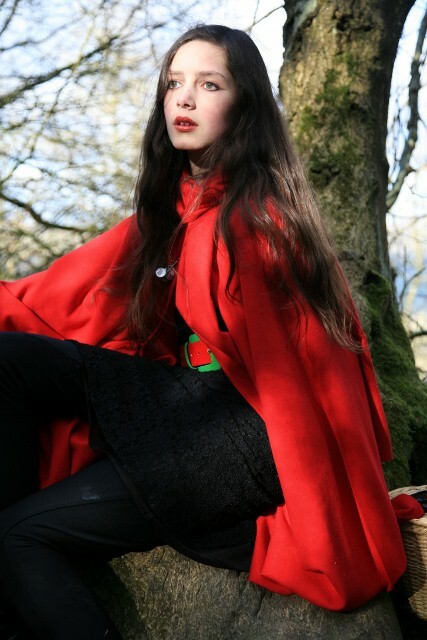 You wear capes very well- it's like the style was made for you! The sunglasses add further drama and glamour. Everything is perfect, the setting is unbeatable, the cape is just amazing, and also the model is excellent as always. I really admire the quality of every shoot you did. You look so good in red it's insane, the cape was such a great find! love the incoperation of the stories with the posts. the cape is beautiful, the shots are brilliant,kudos!! That bright green belt buckle with the red cape is just genius! Such a surprising splash of color. After reading it and then scrolling back up to relook through the pictures, her character really comes through. It's like adding a whole other element to the outfit that really gives it some meaning. This is brilliant! This is a perfect example of why your blog stands head and shoulders above so many. The photos are well executed, strongly composed, with interesting characters (so much so that you honestly feel like you could be looking at a real fashion editorial). 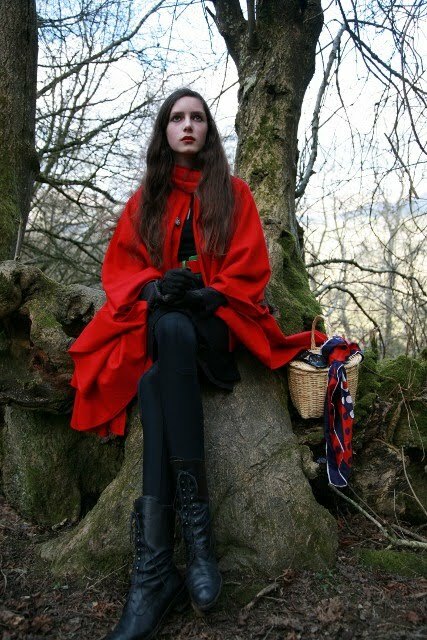 I'm loving the glamour of all of it - from the bright red cape to the repeated jodhpurs to your mum's splendid lace-up boots. Well done! Oh my goodness, this cape is amazing and looks SO good on you! These pictures are unreal. Lovely! oh-my-god totally georgeus!!! what a cape! Bravo...these pictures are devine, truly devine! Another master piece Roz, red is perfect for you with your dark hair and eyes. Thanks for your comment on my post about The Cove, I hope you managed to take a look at their website. p.s. did you manage to find any of George Orwells books? adorable! really cute, and well put together. the scarf on the basket is the perfect finishing touch. here there is always a surprise, i love it!! 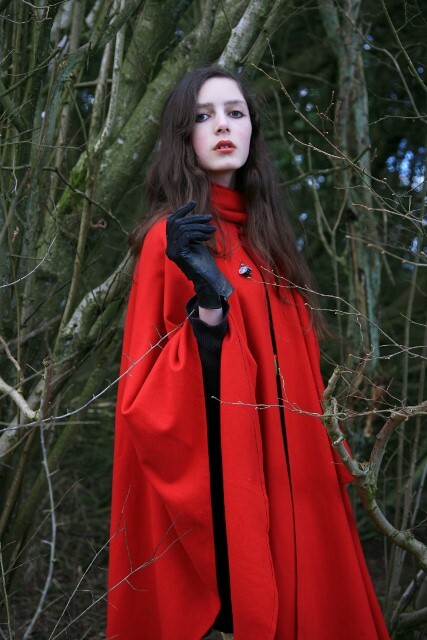 red cape + gloves = fashion fabulous look. Seeing as I love your blog so much, I've just awarded you the Sunshine award...details are on my blog! That is a stunning set of photos - the cape is gorgeous and everything comes together so well! 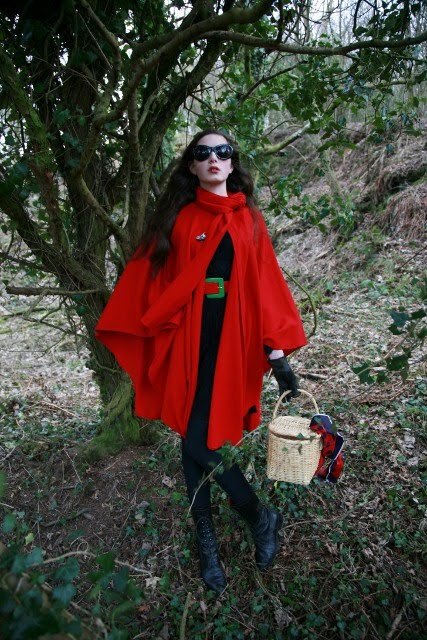 I love your blog, and that cape is amazing!! THAT CAPE IS PURE HOTNESS! 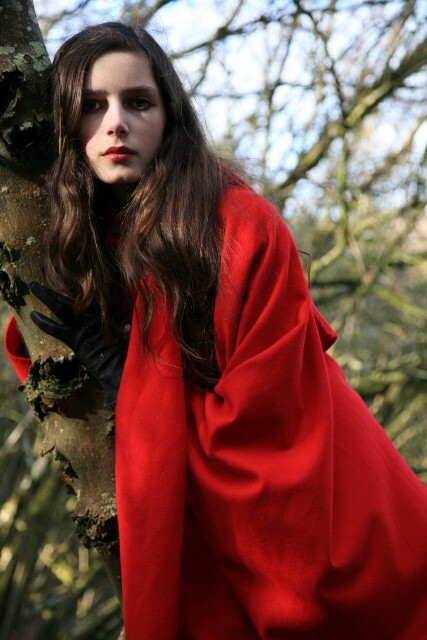 love little red riding hood! the color red paired with the green foliage is a beautiful combination. these set of photography are gorgeous!!! 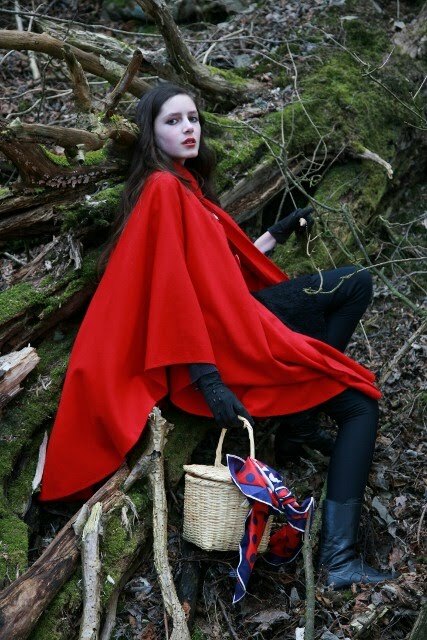 These photos are great, you really do look like little red riding hood. I loved your description of the woods, I wish I had woods near by. 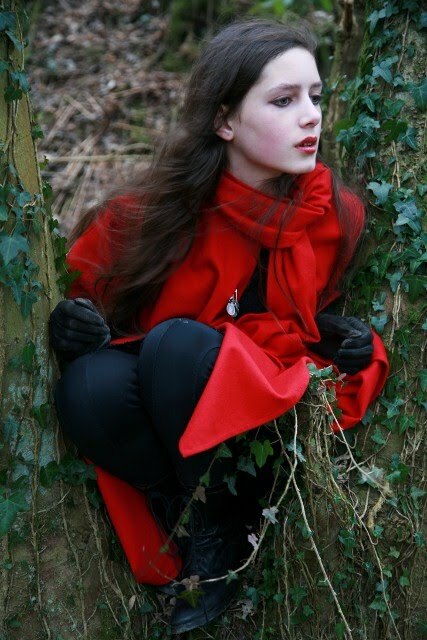 It looks like a story and you really do look like an elegant version of Little Red. amazing photos, amazing words, but i have to say for the day-to-day i am not a big cape fan, i find that they look to cartoony which totally works above, but not so much in real life. I love the concept of the shoot and RRC sounds simply fabulOUS! 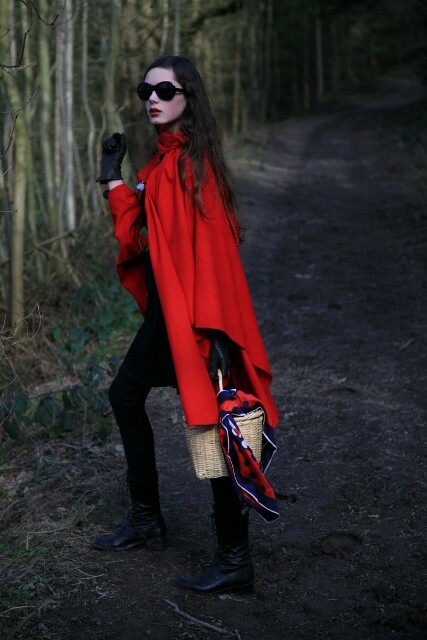 The whole moodiness of the shoot is really grabbing, i like how the dramatic creepy setback of the woods/dangerous red of the cape link together. Also red suits you so much! I think it's great how you always incorporate the good old english countryside in your shoots, and always integrate it's natural beauty with the clothes- very inspirational and always gives your photos an edge of drama/added beauty!